Chances are, at one point or another during your sales career you either read my first book, “Getting Into Your Customer’s Head ®” or perhaps participated in the sales training program of the same name. Here are just a few of the improvements that we have made to our sales training program. First, one thing that hasn’t changed is the “Sales Wheel” sales model that matches selling “roles” with the customer’s buying process. No sense reinventing the wheel, right? Apart from that, every chapter in both our sales training program and my new book has been rewritten with lots of new ideas. Because selling is much more complex today than it was in 1996 what appeared in “Getting Into Your Customer’s Head as the final module/chapter, “Winning the Complex Sale”, has been significantly expanded and now appears as module two. Additionally, four outcome-based “Milestones” punctuate the selling process and provide built-in opportunities for formulating your sales strategy. 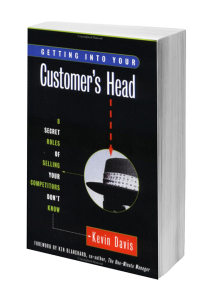 When I wrote Getting Into Your Customer’s Head in 1995 I had fifteen years of sales, sales management, and sales training experience. Now I have over thirty years of experience, and I’m certain this will be apparent to you. A new level of prescriptive “how to” sales strategies and questions to ask. it will be apparent. I hope it shows. Every module and chapter has been re-written with new examples and exercises. Each module contains 3-5 “keys” to sales effectiveness. These keys provide a higher level of sales sophistication – and simplicity. A “Jeopardy-like” content review game helps you learn and retain the “keys to sales effectiveness. All new exercises, case studies, etc.